First of all, don’t ask me why I’ve kept this paystub for 19 years. I’m a packrat okay. I mean, how many people still have the first paystub from the first job they ever had? Now, on to the story. It was my 10th grade year of high school. I was 15 years old and really wanted a job, but wasn’t sure where to apply. Most of the kids I knew were either hustling drugs, working at fast food joints or doing nothing. I had spent the past 2 summers working down at the print shop in the alley, but they closed at 5pm each day and I didn’t get home from school until almost 4 o’clock. I really liked cleaning up the print shop cuz they paid me in cash, but it was time for me to find a real job. One day while riding my bike through the city, I saw a sign in the window at Baskin-Robbins. I don’t remember exactly what the sign said, but it either said “Help Wanted” or “We’re Hiring”. Anyway, I chained my bike to a nearby tree and walked inside. I recognized a girl that I went to school with. I didn’t know her, but I had seen her a few times. She was kinda fly too and had those real big earrings with her name in them. It surprised me that she was working there. She seemed more the type to have a drug dealer boyfriend and not have a job herself. I asked for an application, sat down and filled it out. I left without ordering anything and went home. A few days later the manager at Baskin-Robbins called me for an interview. I don’t really recall what happened in the interview, but I know that I was nervous. However, the offered me the job. Maaaaaaaaaan… I was so excited, I was gonna be the ice cream man. They were gonna pay me $3.35 an hour to work about 4-5 hours each day. That was good money to me back then. I was gonna get paid to serve and eat ice cream. There wasn’t a job better than that one. It was better than working fast food and coming home smelling like burgers and fries every day. The first few weeks on the job were cool. All my friends came by and of course wanted me to hook them up. I never gave away anything, but sometimes I scooped a lil’ bit more than I was supposed to as a hook-up. One day the manager saw me doing this and after the ‘customer’ left, she asked me if I had forgotten how big the scoops were supposed to be. For the next few days they made me scoop the ice cream and weigh it on the digital scale. It had to be 4 oz and anything more/less than .5 I had to rescoop. That was a pain I tell ya. Every day after working my shift I had to take a very long hot shower. I’d have dried up ice cream all over my clothes, my arms and at times my face or my hair. After a few months, they gave me a raise to $3.65 an hour. I was really happy with that. However, I started to not like the job as much. When the warm weather hit, the lines would be out the door. I would sometimes scoop from the moment I walked in the door, til the time came for us to close. Going into the big freezer to replenish the ice cream was no joke either. I’ve heard those horror stories when someone robs the place and they make folks get in the freezer. I understood how they didn’t survive on most of those occasions. That thing was ice cold and I was only in there for a minute or two. Alos, I always hated when folks would come right as we were closing. It would be 9:56 and I’d be headed to the front door, only to be greeted by a family of 6. Those were always the people who had no idea what they wanted, so we had to sat and wait for them to make up their minds. From the first day I started working I took ice cream home. We were allowed to make whatever we wanted to for ourselves to take home each night. But after a number of months, I grew tired of ice cream. I would still bring stuff home, but it would be for Mom or the house. I always made sure we had Egg Nog and/or Pumpkin ice cream for the holidays. I had gone through all 31 flavors and then some. I was able to determine what flavor was what, just by looking at it. I didn’t want to eat anymore banana splits or pound cake ala modes. I even grew tired of eating strawberry ice cream and that was my favorite. All in all I was tired of Baskin-Robbins ice cream. On occasion I would trade my ice cream on the days I worked, with friends who worked at Kentucky Fried Chicken (wasn’t just KFC back then), Mickey Deez or the local pizza joint. They wanted dessert and I wanted food, it was the perfect trade off. I left that job after about year or so. I left that gig for the Dunkin’ Donuts which was right up the street. That was an adventure in itself. This was long before the two companies merged together. I don’t think I ate ice cream for close to 2 years after that. I just couldn’t get myself to eat any. If I recall, when I did go back to eating ice cream I bought a ½ gallon of Edy’s. 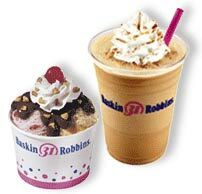 However, after a few years I did go back to Baskin-Robbins. In fact, I would go back to the one I worked at. I would at times mess with the cashiers and say something like “Is the emergency alarm button still to the right underneath the counter?” or “Now you know boss lady would be mad if she saw how big those scoops were”. I would always get a funny look from them when I said things like that. The one thing a lot of folks don’t know about Baskin-Robbins is, they use different size scoops depending upon what you’re getting. If you order a 2 scoop sundae, then they’ll give you two 2.5 oz scoops and then add the toppings. However if you order just two plain scoops, then you’ll get two 4 oz scoops. The trick to getting more ice cream for your money is to just ask for two scoops. Let them think that you only want two scoops and nothing else. Then after they put the scoops in the cup, ask for your toppings. On occasion you’ll get an employee that’ll tell you that you’ll have to pay extra or that they have to rescoop if you want a sundae. I’ve even had managers get mad at their employees after seeing how I got around the small scoops. I remember one day when the manager screamed at this Black girl working there. She hollered “You know better than to use big scoops with the sundae”. I took up for the young lady and hollered back at the manager “Maaam, she was only doing what I asked her to do. You have no right to talk to her in that tone and disrespect her in front of your entire store like that. I asked for the large scoops with the toppings in that fashion and I’m willing to pay extra for what I want. You won’t have any employees if you talk to them like that!” The manager remained silent and walked away. The young girl halfway to tears smiled and handed me my ice cream. I paid for my order and gave her a $10 tip. I wasn’t trying to get her in trouble. She only did what I asked her to do. The manager had no right to yell at her for that at all. When I go to Baskin-Robbins, I still ask for samples of the ice cream even though I’ve tasted pretty much everything. They get exotic stuff every now and then, but for the most part the menu is the same. I walk up in there and get my pint of Daiquiri Ice (really good if you’ve never had it) or a two scoop sundae (correction… lol), or two scoops (one Pralines & Cream, one Butter Pecan) with caramel topping or a scoop of French Vanilla along with a scoop of Very Berry Strawberry with some strawberries on top. It’s rare that I order anything else but one of those 3 things. I used to get Raspberry Sorbet, but most stores don’t carry it anymore. They generally have Raspberry Sherbert and it’s not the same. Anyway, I just realized after typing all of this, that I’ve talked about ice cream this long. That’s kind of crazy in itself. The theme of the post was about my first real job. Somehow I got a lil’ bit carried away in talking about it. Anyway, do you remember your first job? Was it a fun job and do you recall how much you made when you started? I worked for my mom in her office from the time I was in 5t grade up to 11th, then I decided I wanted a real job and went to work at Mrs Winners Chicken, for about three months, hated smelling like chicken and potatos everda, and it interfered with track so I quit, and went back to work for my mom until I found another job. 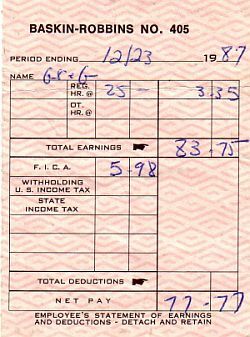 Actually,LOL, I have all my check stubs from my first job, which lasted the whole summer of 1989. I made only $3.35 an hour. I even have my ID from that job and my first state ID. LOL. that was such a long time ago…..i think i was like 6 yrs old then….I remember my first job was at Toys R US…Xmas season….i think i made $5.25 an hour. After that experience, i appreciated my money and the value of a dollar more. WOW! That was light years ago. Man, you’re old! LOL! My first job was at Burger King the home of the Whopper. I was making $4.25 an hour. I worked downtown at the State Street location. I quickly advanced to the cash register in my 6 months of employment. LOL! That was something to be proud of back then. I remember coming home everyday smelling like I’d just been flame broiled. I worked at The Gap LOL!! I spent my entire check on clothes in the store…never saved a penny. it was right before college and I needed some gear LOL!! Folding shirts was my favorite cause the way the store was set up I could hide behind a big shelf and half azz fold to kill time. I hated ringing up customers cause all my friends would come in trying to get a hookup…friggin thieven low-lifes LOL!! I can’t remember how much they paid me but I am sure it was barely more then minimum wage. We’ve come such a long way! G-Mo, you know you’re more than wrong for still having the stub, but I guess it can go in a scrap book or something. Nostalgia is a funny thing sometimes. My first job was folding clothes and putting them on shelves at a local children’s clothing store. They paid me out of the petty cash box and gave me clothes. I was like 12. I loved the job. That’s funny you still have your first pay stub. How cool! Through this job I developed a natural ability to engage people and persuade people to spend $300 dollars on glasses that weren’t necessarily high fashion names, but rather superior lens quality. I learned the difference in quality between a pair of Gucci shades verses a pair of Revos. The bad part to retail is of course the hours. I don’t like working at night or on my weekends. I don’t even want to talk about the holidays I missed because I had to work. I still have my very first paystub too, I guess I’m a pack rat too. LOL Anyway I was 15 and I was making $5/hr working as a Student Library Page. The kicker was that I had to catch 2 busses and then walk 1 1/2 miles to get to the job. I made sure I always had Thursday off because I didn’t want to miss the Cosby Show. @ Ma – $1.25 an hour!!!!???? Good Lord!!! @ deepnthought – Lol @ smelling like chicken & potatoes. @ Shai – The stub and the ID, now that’s too much. @ NegroPino – Aiiiight now, enough with the subliminal old man jokes. Toys R Us was one of the places that I had wanted to work as a kid too. @ Dynasty – Ditto to you on the old man jokes and you weren’t even tryna hide it. I don’t eat red meat too much anyway, but if I do go to BK, I’ll try to remember that. @ 1969 – Suede Puma’s huh? You still got em? Lol. I feel ya on the kicks though. I remember buying some Adidas Top Ten B-ball shoes with some of my work money. @ Royce’s Daughter – LMAO at your sneaky, laziness. @ Aly Cat 121 – Glad you remember the $3.25 days. I don’t feel so old now… lol. @ Bklyn Diva – At least you learned how to type, I still can’t. @ BluJewel – Like I said, I’mma packrat. Oh yeah, since you like folding clothes, I’ve got some fresh laundry over here. Ha ha. @ A woman on the move – You convinced folks to buy $300 sunglasses??? I bet you can sell ice cream to an eskimo. @ GTL – I still dunno who FICA is. Some more govt BS I suppose. @ Lāā – You went through a lot to get to that job. Better you than me.